Kyoto Prefecture has a rich and close relationship with its forests and landscapes, and has a globally important natural and cultural heritage to safeguard for future generations. Kyoto Model Forest spans the entire Prefecture of Kyoto and is unique in its governance structure. Encompassing some 13,000 private forest owners and 26 local governments, it is essentially a collection of small detached forests, each with its own management approach, united under the Model Forest banner – a sort of “network of networks”. The Kyoto Model Forest Association (KMF) was founded chiefly by the Kyoto prefectural government to promote forest conservation activities by a wide range of stakeholders to combat widespread forest degradation resulting in risks to ecosystem services. Since its founding, KMF has launched unique activities for forest resource management with the cooperation of forest owners, residents, volunteer groups, private industry, universities, and local governments. In Kyoto Prefecture, 17 World Heritage sites, prominent national treasures of Japan, historic buildings, Japanese gardens, and other assets that represent Japanese culture are preserved integrally with the area’s rich forests and natural environment. Forests in Kyoto fundamental to this attractive area are assets shared by all residents, attracting 87 million tourists annually, and providing wood for traditional construction. 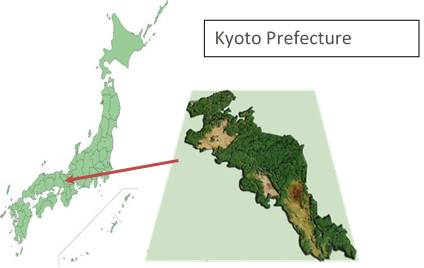 Of the area of Kyoto Prefecture, 74% is covered by forests (342,000 ha), which consists of 34,000 ha of national and public forests and 307,000 ha of private forests. Plantation areas account for 38% of all forests in the Kyoto Prefecture. With an annual production value of 1.6 billion yen (equivalent to approximately USD 14 million) and annual logging amount of 150,000 m3, forestry in Kyoto Prefecture is conducted on a small management scale. Characterized by steep terrain with intricate ridges and valleys, most of the prefecture’s interior forests are economically inefficient and remain untouched. Even forests near settlements are poorly managed, primarily, due to a decrease in the population in the mountainous regions. Meanwhile, in Kyoto City, forests surrounding three sides of the city form a traditional landscape together with temples and gardens, which are important for tourism. The forests are actively managed from a landscape perspective by administrative bodies, those involved in tourism, local residents, and forest owners. 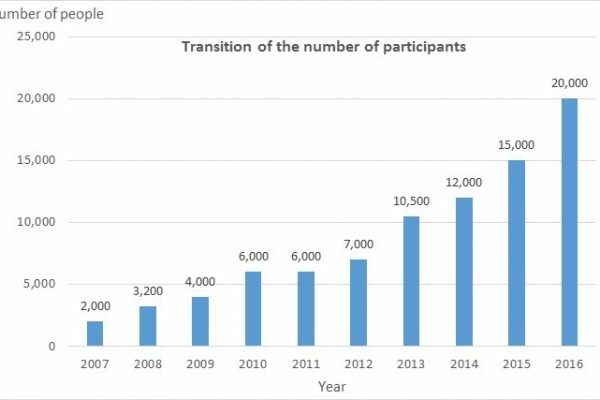 In the Kyoto Model Forest, KMF, the Kyoto prefectural government, and 26 local governments are engaged in cooperative forest conservation projects in their areas. These projects cover approximately 3,200 ha of forests in Kyoto Prefecture. KMF acts as the coordinating body, connecting the projects conducted in individual areas. KMF comprises 226 members, including private industry, cultural and artistic groups, Non-Profit Organizations, universities, local governments, and forest owners. Promote sustainable management of forests to preserve rich forests by stopping forest devastation and restoring deteriorated forests. Strengthen various forest functions that bring benefits necessary for regional sustainable development through efforts to conserve mountain ecosystems, including their biodiversity.